This recipe is my last plain white bread recipe. 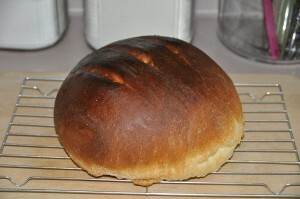 Over the past few months, I’ve made Basic White Bread, Basic Home-Style Bread, Broiled White Free-Form Loaf, Buttermilk White Bread, French-Style Bread, and Italian Feather Bread. I like white bread, but enough is enough. 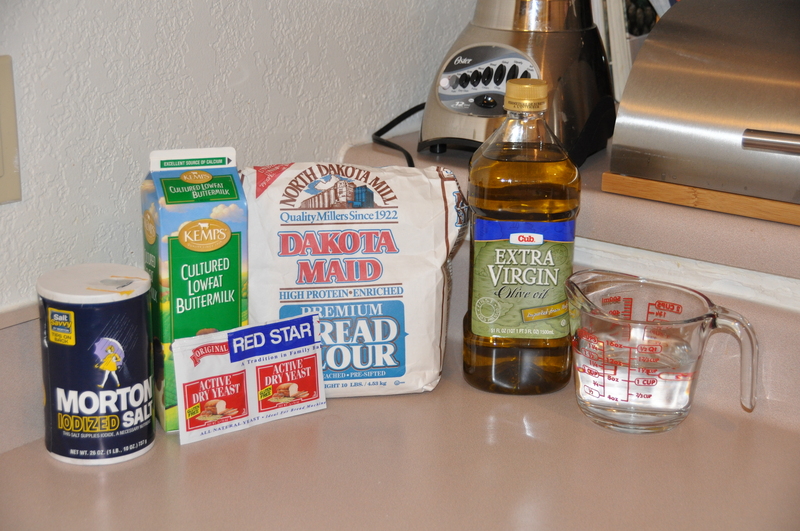 I mixed the remaining flour, along with the salt, olive oil, and buttermilk into the sponge and then kneaded it. The sponge created a much softer dough than white flour typically yields. After about 10 minutes of kneading, I let the dough rise for two hours. 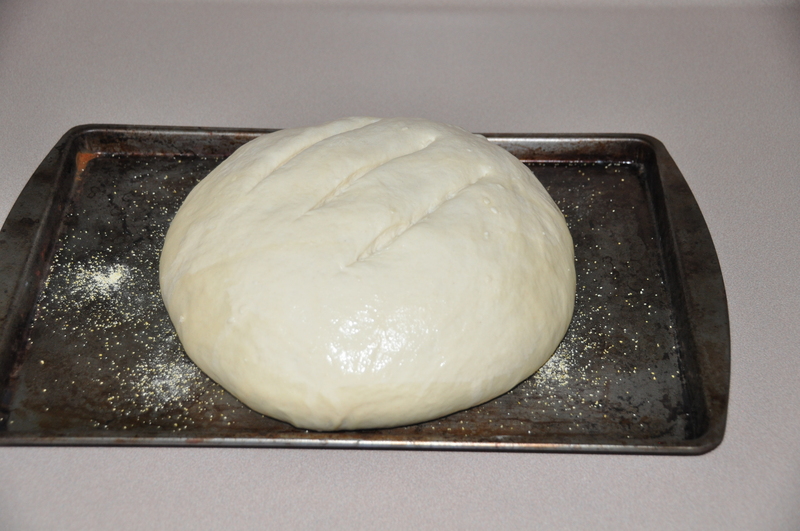 Then I punched it down, kneaded it again, and let it rise for an additional hour. Finally, I shaped it into a round loaf and let the loaf rise for 45 minutes. White Free-Form Loaf is not a recipe for the impatient. 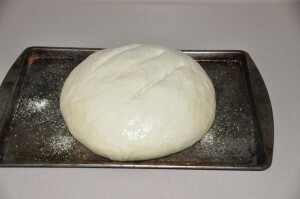 The method for baking White Free-Form Loaf is as involved as the rising process. First, I preheated the oven to 425 degrees and placed a pan of boiling water (I used an 8 x 8 cake pan) on the lower rack. Meanwhile, I brushed the top of my loaf with cold water, slashed the top, and waited five minutes. 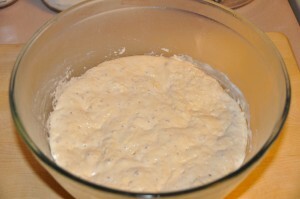 Next, I put the loaf in the oven, turned the temperature down to 375 degrees, and let the loaf bake for 20 minutes. At that point, I brushed the loaf with cold water again, and then put the loaf back into the oven for additional 30 minutes. Finally, the loaf was done. The bottom crust was adhered to my baking sheet–I had the same problem with my Broiled White Free-Form Loaf. I’m not sure if the problem lies with my loaf shaping method or if I just need to use more cornmeal on the baking sheet. We ate the bread tonight in the form of tomato-basil-mozzarella paninis cooked on our George Foreman grill. White Free-Form Loaf is a nice basic loaf of white bread; however, the taste is nearly indistinguishable from Basic White Bread, which is a lot less trouble. After trying all of the white bread recipes, the ones I would bake again are Basic White Bread, Basic Home-Style Bread, and French-Style Bread. Now it’s time to move on to something else–like the half-dozen rye bread recipes!